Or, why I’m writing 75,000 words in the month of November. It’s been a busy year for me. Lots of game writing contracts, some work I’m doing with a secret collaborator, and the launch of The Iron Hound have kept me busy. 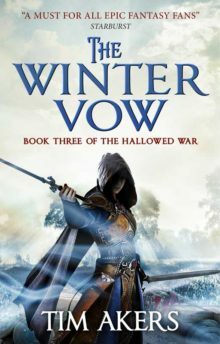 On top of all those things, I have the third and final book in the Hallowed War series to write. We had to get an extension on the deadline, but in order to have the book out on schedule next year, it needs to be done by December. This December. Like, in thirty days. Problem is, my actual math is a little more. It’s not really 75k words, it’s 30 chapters, but my average chapter is 2500 words long. Truthfully, that’s as long as they go, with a lot of them coming in at just over 2k words, but that’s not important. What’s important is that I pretty much need to write a chapter a day to finish the book. There are complications. Right now I’m riding a hell of a head cold. I have family coming in later this week. I’ve never tried to write every day for thirty days, and am not sure what that’s going to do to my creative reserves. And I still have game contracts that I need to work on. But I’m going to set myself this goal, and publish it, and then offer daily updates on my progress. And… I guess I’m going to get started right now. Ta. It’s a challenge, particularly with a headcold AND family (both at once, yikes) but if anyone I know can do it… it’s you.